Established in 2006, 29 South is slinging classic southern fare with a modern, sophisticated twist. If 29 South looks more like a historical home than a restaurant, that’s because it pretty much is. The Murdaugh family built “The Little Purple House” back in the early 1900’s. After being in the family for almost a century, Chef Scotty Schwartz gave the old home new life as a modern restaurant. Chef Schwartz is completely committed to using only the freshest and local ingredients. There is even a full garden in the backyard right behind 29 South. How’s that for local? Do you usually find yourself skipping the appetizer? You’ll want to rethink that at 29 South. The Pulled Pork Spring Rolls appetizer features pulled pork that is smoked out back and served with Carolina slaw and a sweet chili glaze. Does your tea every come out too sweet or not sweet enough? At 29 South, you call the shots on the sweet tea. But you won’t find yourself trying desperately to dissolve sugar crystals with a spoon in a cold glass–didn’t anyone pay attention in chemistry class? 29 South delivers simple syrup in an old glass flask to your table with your tea. Be as heavy or light handed as you please! Speaking of sweet tea, 29 South has a Sweet Tea Brined Pork Chop served with mac & cheese and a warm blackberry ginger preserve. Remember that smoker out back? The Molasses Lacquered Painted Hills Short Ribs sit in the smoker for a whopping 3 days before they’re ready to be served. The melt in your mouth boneless ribs are served with cornbread pudding and a fingerling potato salad–a winning combination if there ever was one. A sweet ending to a southern meal is expected, so you might as well get comfortable for 29 South’s Coffee and Doughnuts. This decadent twist on the classic bread pudding uses glazed doughnuts drizzled with butterscotch and local mocha ice cream. Frankie, a chef at 29 South, told us to always be on the lookout for new menu items. And freshness is at the top of Frankie’s list. Stop by 29 South for lunch or dinner and find out why this southern gem is an Amelia Island favorite. 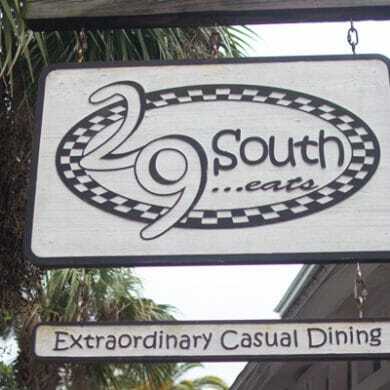 29 South is located at 29 S 3rd St, Fernandina Beach, FL 32034. For more information or to look at a complete menu, visit the 29 South website or call (904) 277-7919.